I’m a bit swamped this week as I’m heading out for vacation on Thursday afternoon. I’ll do my best to expand on some of these topics as the week goes on, but for now, I’d like to offer up a short post on a topic I’ve covered in the past: MTA advertising. As part of a back and forth with Pamela Geller’s group, the MTA has struggled to craft a constitutionally-acceptable ad policy that doesn’t infringe on First Amendment protections. The agency tried to amend its policy in late 2012 but has been engaged in protracted legal wrangling over the revised versions. Recently, a federal judge found that the MTA had to run anti-Muslim ads under its policy, and in response, the MTA has barred all political advertising from appearing in ads. (Check out the revised policy in this pdf). Geller has already said she plans to sue the agency over its latest revisions, and so far, the MTA has yet to win a case against her group. As a lawyer, I’ve always been intrigued by this give-and-take, and I’ll keep an eye out on this story as it unfolds in the coming months. It has been a banner week for the mundane in the subways. Mired in the morass of a slow April with the MTA’s ambitiously expensive capital plan on tap, the openings of the Fulton St. Transit Center in two months and the 7 line extension…eventually…, and still no idea how the Governor is going to pay for the new Tappan Zee Bridge, the stories of the week have focused around a rat and some cleavage. These are, apparently, the things that count. The rat story is your garden variety “rat on subway car, passengers freak out” type. Like many New Yorkers, the rat was trying to get somewhere on Monday morning when it ended up on an A train at Fulton St. The doors closed, and the passengers freaked out at something approximately 1/100th their size. It’s an impressive display of New York cowardice as grown adults stood on subway seats, screamed and, if you listen to the audio track on the video above, sobbed for two minutes while this rat tried to run away from the nutty human giants surrounding it. Now, don’t get me wrong; I’m glad I wasn’t on that subway car. And, yes, rats do carry rabies. But something about this reaction just strikes me as incredibly pathetic. It’s New York gone soft, and it’s generated, according to a Google News search, over 170 articles throughout the country. Who knew a rat on the subway was so newsworthy? In response, an MTA spokesman told Metro that the agency is continuing to fight rats as best they can. This brouhaha probably would have died down had Governor Cuomo not gotten involved, but seemingly having solved every other transit problem he pretends doesn’t exist, the Governor opted to take the MTA to task for their ad policy. The ad policy recently come under judicial scrutiny, and in order to comply with the pesky First Amendment to the U.S. Constitution, the agency had to re-write its policy to be more encompassing. Now, the Governor via a letter to the MTA has requested the agency review its ad policy. Of course, because the MTA is a government agency, “family-friendly environment” can also be interpreted as a content-based restriction on free speech. Is there a compelling state interest to avoid ample, but still covered, cleavage on an ad in the subway? If the state hasn’t dubbed it obscene, one agency board member said, the MTA would lose the lawsuit if it rejected the ad. So now, with real issues facing the region, the MTA will spend time on its ad policy to appease a governor that the cynic in me believes is trying to appeal to more conservative voters in order to ring up some crushing reelection poll numbers in November. This is transit policy in 2014. I think I’ll stick with the rats instead. With ads already appearing on Metrocards, are audio spots the next frontier? How’s this for the perfect storm of annoying transit ideas? Imagine the incessant audio announcements we’re currently subjected to on subways and, to a lesser degree, buses. Now imagine if those were advertisements. Are you sobbing in the corner yet? It’s not a particularly far-fetched idea. Already, everything transit covered in ads. Buses carry displays on the outside, stations come sported full buy-outs, the video screens in some of the newer subway cars were once designed to broadcast advertisements and even MetroCards can now be sponsored. And now, as Eric Jaffe detailed at The Atlantic Cities yesterday, audio ads for buses are on the way in some U.S. cities. Audio ads in transit systems are part of a natural progression as transit agencies seek to squeeze every dollar out of every possible outlet. These ads too aren’t just stock spots. The company selling them has implemented a GPS-based technology that allows ads targeted to specific routes and destinations to play as buses near those locales. Currently, riders in 11 metro areas — but not, obviously, New York — are subject to these ads, but some transit agencies are hesitant to embrace them for fear of irking riders. Commuter Advertising does its best not to overwhelm the airwaves. (The company was founded by two regular transit commuters, after all, during a serendipitous trip on the Chicago El.) The audio ads never last more than 15 seconds, and they only run at 8 to 20 percent of all transit stops, which means every fifth time the door opens at most…What transit commuters worry about is the slippery slope. Print ads are no problem until riders find themselves standing at a bus stop transformed into a Dunkin’ Donuts oven. 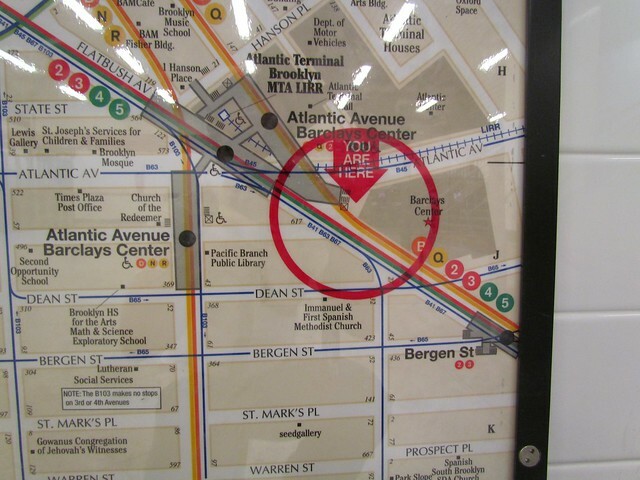 Station names are fine to sell unless the system map becomes geographically meaningless. Tame audio ads are likewise acceptable — it’s the idea that one day platform loudspeakers will play them non-stop that frightens riders. As things stand, though, audio bus ads seem to reside at the tolerable end of the transit marketing spectrum. Riders can always wear headphones, and audio campaigns might even prompt transit agencies to fix their habitually busted speaker systems. A little annoying? Sure. Demeaning or intolerable? Hardly. If the money is right, and the approach respectful, they might even be the responsible choice. A win-win on paper, as Jaffe calls it, though depends on the revenue generated. Even for a relatively small system like that in Champaign, Illinois, the $150,000 is a ripple in the bucket. The CUMTD has annual expenses topping $42 million, and the money from audio ads won’t avert any sort of fare hike should one be necessary. Play enough audio message, though, and riders feel harassed by them as they do in the New York City subway. Ultimately, this is a delicate area for any transit agency. Riders are a captive audience for advertiser eyeballs, but riders can grow irate in a split second especially when public perceptions surrounding mass transit aren’t particularly positive in the first place. More advertising in and on public transit may be inevitable as agencies look to recoup lost subsidies as best they can, but I’m not looking forward to the day we hear audio ads on buses. Subway advertising now includes space on the front of the city’s fare cards. As I’ve walked through the Times Square subway each morning this summer on my way to work, I’ve noticed that the full station ads have seemingly been dormant. Throughout June, the billboards promoted BBC America’s “Copper” show, but after that, the pipeline dried up. The 42nd St. Shuttle cars are decked out in soccer adverts, but it’s noticeable that the in-station ads are due for a refresh. Twenty or even ten years ago, New Yorkers would have been shocked by the concept of station advertising. After the heydays of the 1950s, MTA advertising hit the skids. We had Julio and Marisol, Dr. Zizmor and a bunch of ESL classes. While some of those persist today, they’ve been joined by Madison Avenue’s bigger accounts. Anheuser-Busch and ABC now buy out full car spots while Sleepy’s now has banners on the outsides of some train cars. Even Metrocards now carrying advertising, and big names such as The Gap and Audible.com are forking over big bucks for the spots. The article from 22 years ago portends video ads — a technology ever coming soon. New clocks were to provide 10 full-color ads per minute and train traffic information with an eye toward bringing rotation ad screens to the interior of the city’s subway cars. These days, such video screens are slowly escaping the pilot program label while some of the new R160s have space for video ads but no commercials in rotation. Some things change over the decades; some do not. Meanwhile, the MTA’s advertising program has been a recent success story. Ridership has exploded upward since that 1991 article, and Transit, with over 5 million captive riders a day, now brings in $120 million annually in advertising revenue. It’s been a long, slow climb with untapped potential sitting out there, but we’re no longer subjected to hemorrhoids or roaches. Rather, we have station names and Metrocard ads instead. With Major League Baseball’s All Star Game returning to New York City this year, advertising focusing around it is starting to ramp up. This week, a fully-wrapped 7 train — the first of its kind on the IRT Flushing Line — made its debut. The current sponsor is Head & Shoulders, and the advertisements decorate both the inside and outside of the cars. For many New Yorkers — those who haven’t seen the Shuttle become an advertising testing ground — the 7 train is a novelty. The MTA had secured a sponsor for a wrapped 6 train a few years ago, but this marks the first full-car opportunity for the 7. The MTA wouldn’t tell me how much money this car generates, but there will be another one sponsored by T-Mobile making an appearance beginning in July. Over the years, the MTA has ramped up its advertising efforts, boosting revenues in excess of $120 million, but it still seems like an untapped market. Video boards have started showing ads above station entrances, but in-system advertising has remained static. The video screens on some of the new rolling stock are supposed to be able to show ads, but the only clips in rotation have been MTA PSAs. Metrocards now carry ads as well, but those rates are relatively modest. When the MTA lost its court ruling over Pamela Geller’s anti-Jihad advertising on First Amendment grounds, Judge Paul Engelmayer told the authority to amend its advertising policy or else. The MTA Board didn’t have a chance to address the issue until yesterday, a few days after the ads debuted and were defaced. With one person in jail over the ads, the MTA announced yesterday a revised advertising policy. To be clear, the MTA does not believe the First Amendment compels the MTA to open up its ad spaces in this way to a wide range of expressive communications. MTA could, for example, adopt a narrower commercially oriented ad policy, one that limited the range of ads it will display to those selling a product or service, and by doing so, avoid having to run demeaning or divisive ads such as the AFDI ad that resulted in litigation. But the MTA for decades has permitted its ad spaces to serve a broader communicative function than mere commercial advertising, and the Board, today reaffirms that tradition of tolerating a wide spectrum of types of ads, including ads that express views on a wide range of public matters. With that choice also come First Amendment limitations that constrain the MTA’s ability to disallow particular ads because their messages are uncivil or divisive. We had thought this did not mean having to run divisive ads that demeaned others, but the recent litigation tells us otherwise. A cost of opening our ad space to a variety of viewpoints on matters of public concern is that we cannot readily close that space to certain advertisements on account of their expression of divisive or even venomous messages. We deplore such hate messages and remain hopeful that the vast majority of advertisers in our buses,subways, trains and stationswill remain responsible and respectful of their audiences. And when, as there inevitably will be, a very few sponsors of ads stray from civility, we have every confidence that our customers will understand that in our enlightened civil democracy, the answer to distasteful and uncivil speech is more, and more civilized, speech. In response to the new policy — which still limits a wide array of false or misleading ads and offensive and mature content — the Straphangers Campaign sent out a list of questions: ” How will MTA determine if the ad contains “religious, religious, or moral” expression?, they asked. “What is the definition of a “conspicuous” legend? How much of the ad space would be devoted to the legend? What should be done in the case where there are many sponsors?” In 2000, the Straphangers were involved in another legal fight over MTA advertising when the authority refused to run an ad comparing subway crowding to cattle cars. Gene Russianoff’s questions do seem reasonable, but so too does the MTA’s new policy. This should, for now, allow everyone to move forward with a policy that protects free speech, whether the reader agrees with it or not, and protects against future litigation as well. After a year of legal wrangling over First Amendment concerns, Pamela Geller’s anti-Jihad ads went live yesterday. Transportation Nation tracked down enough people to draw out a mixed reaction to the ads which have popped up in ten stations throughout the city. “It’s hard for me to look at this poster and actually take it seriously,” one Muslim woman said. True to New York spirit though, the ads lasted barely a day before someone took to editing them. As Mondoweiss reports in pictures, someone or someones have taken to placing stickers over the ads with their own message. So far, ads in at least seven stations — 57th Street and 5th Ave, 28th Street, 23rd Street, two on 42nd street, 34th street and Grand Central — have been defaced. Take that for what you will. In the meantime, the MTA has yet to announce a new policy for evaluating advertisements that better adhere to the spirit and letter of the Constitution as they cash Geller’s checks nonetheless. Pamela Geller’s controversial anti-Islam ads will begin appearing in 10 subway stations throughout the city, the MTA announced yesterday. These ads have been the subject of much litigation over the past few years as Geller’s American Freedom Defense Initiative group successfully sued the MTA over its advertising practices. After Geller won her case on First Amendment grounds, the same judge chided the authority over its slow response to the ruling, and thus, in advance of next week’s board meeting, the authority’s hand has been forced. As The Times reported yesterday, the MTA is essentially being forced by a judge’s order to accept and publish the ads. The MTA had asked for a stay pending the September 27 board meeting, but the judge told the MTA it had two weeks to revise its policy or appeal. Instead, the MTA will run the ads as the references to Muslims as “savages” do not constitute “demeaning” language under the current guidelines. The MTA said that, in spite of the geopolitical events in the Middle East, it must accept the ad, but it could have appealed or revised its policies. The judge’s initial ruling gave the authority enough of an out to reject the ad had it worked to restructure its advertising guidelines, but the Board hasn’t met since the ruling came out. So the ad will arrive, amidst controversial and fanfare. Hopefully, a new ad policy isn’t too far behind.